Charleston, SC is the perfect location for a family vacation. The kids can go wild with plenty of fun and engaging activities that entertain and inspire. Check out these fun things for kids to do in Charleston, SC! The South Carolina Aquarium is home to over 5,000 animals. There’s the 385,000-gallon Great Ocean Tank, where kids can get up close and personal with sharks, sea turtles, and other beautiful creatures that call the ocean home. Speaking of up close and personal, in the Touch Tank kids can pet horseshoe crabs, Atlantic string rays, sea urchins, and more. And in the Coastal Plain exhibit, kids can experience a Lowcountry swamp at night, observing American alligators, rattlesnakes, and Venus Flytraps! An amazing interactive environment, the Children’s Museum of the Lowcountry is fun for kids of all ages. There’s the art room, where children can build sculptures out of everyday recyclables, create new paintings to bring home with them and try their hand at collage work or weaving. In the medieval creativity castle, kids can dress up like a dragon or a knight and explore an old-fashioned castle. Don’t forget to search for secret passageways! Kids can also chase butterflies in the garden, ride an antique 1939 GM fire truck or explore the high seas on their very own pirate ship! A renowned historic city, Charleston offers plenty of tours. But they’re anything but your typical history lesson. There are many family and kid-friendly tours that can help your children engage with history first-hand. For instance, you can keep the pirate theme going after your trip to the Children’s Museum with the Children’s Pirate Tour. Your guide will be dressed in an authentic pirate costume with a live parrot on their shoulder. 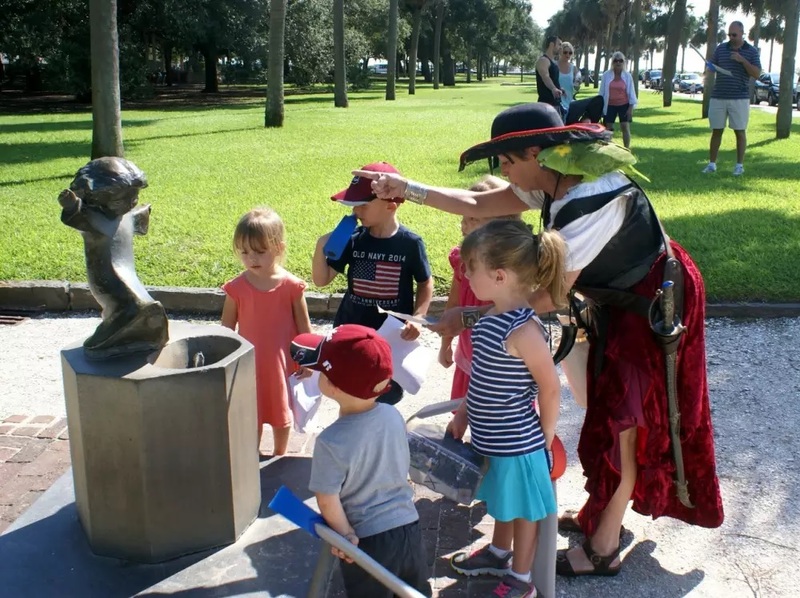 Kids can practice swordplay with foam rubber swords, go treasure hunting, make their own pirate flags and learn about Charleston’s pirate history! Waterfront Park offers a gorgeous view of the Charleston Harbor, but the real attraction for many kids is its fountain that’s specifically designed for them to play in! Get your bathing suits on and dance amongst the spouting funnels of water. Conveniently located in Charleston’s historic district, Waterfront Park is surrounded by opulent buildings, vibrant greenery, and sits only a couple blocks from the Charleston City Market—also a must-visit for any Charleston vacation. One of the major perks when visiting a city that’s located right on the Atlantic Ocean: the beach! And Charleston has some of the best beaches in the state. So after some fun in the fountain, keep that bathing suit on and head to the beach for some body surfing, sand castle building and so much more. Charleston has several nearby beaches to choose from, each offering their own unique experience. Read our guide to find the perfect Charleston beach for your family. The fun things for kids to do in Charleston, SC is virtually endless. There is plenty more to discover. And after a long day of exciting activities, make sure you have a great place to return to. When planning your trip, be sure to book a vacation rental with Walk Away Stays. We have an extensive collection of beautifully designed properties made for families to relax in. You’ll enjoy all the amenities of a luxury resort in the privacy of a home. Browse our vacation rental properties and book today!